Investing in a suitable generator can be your best bet if you are aiming to have a product that lasts for a long time. The choices out there are plenty, and even for me, I found it to be quite cumbersome to pick and choose the generator from the expansive brigade out there. To help you a bit with your decision-making when it comes to choosing an appropriate generator for different kinds of uses, I can surely throw some light on this topic and get you up, close, and personal with the top-5 list of the best 4000 Watt generators. This gas-powered generator is the #1 best seller on Amazon and truly stays true to the hype. If you are looking for a generator to power up your parties, various appliances, or even your workplaces, then you can turn toward the DuroStar DS4000S for all your woes. Starting at 4000 Watts and running 3300 Watts, the DuroStar 7.0 HP generator is complete with a heavy-duty steel frame and a 4-point isolated motor, which lets out minimal levels of noise during operation. With the 8-hour runtime allotted and a 4-gallon gas tank coupled with an air-cooled OHV engine, the DuroStar DS4000S is quite a keeper. It is recommended you also purchase the DuroStar DS4000S-WK Wheel Kit for convenient maneuvering. This generator sports a suave look for a heavy-duty machine, and with the looks come the various features as well. A reliable, portable generator that can come in handy in your RV or even at camping sites or when facing the wrath of hurricanes, the Champion Power Equipment 46539 peaks at 4000 Watts and runs at 3500 Watts. It boasts of an OHV 196cc engine and weighs a solid 140 lbs. Its dimensions stand at 29x21x21, making it easily portable, and it also complies to the EPA carburetor standards, making it environment-friendly. The gas tank holds out 3.8 gallons and can then keep running for a period of 12 hours when the load is at 50%. There are three outputs to this generator: the RV receptacle, a 120-volt duplex outlet, and a 120-volt twistlock. Another quality product coming in from DuroMax, this is the newest model in the 4000 Watt range that is turning heads and is currently reigning in the market. This gas-powered generator surges at 4400 Watt and runs continuously at 3500 Watt. 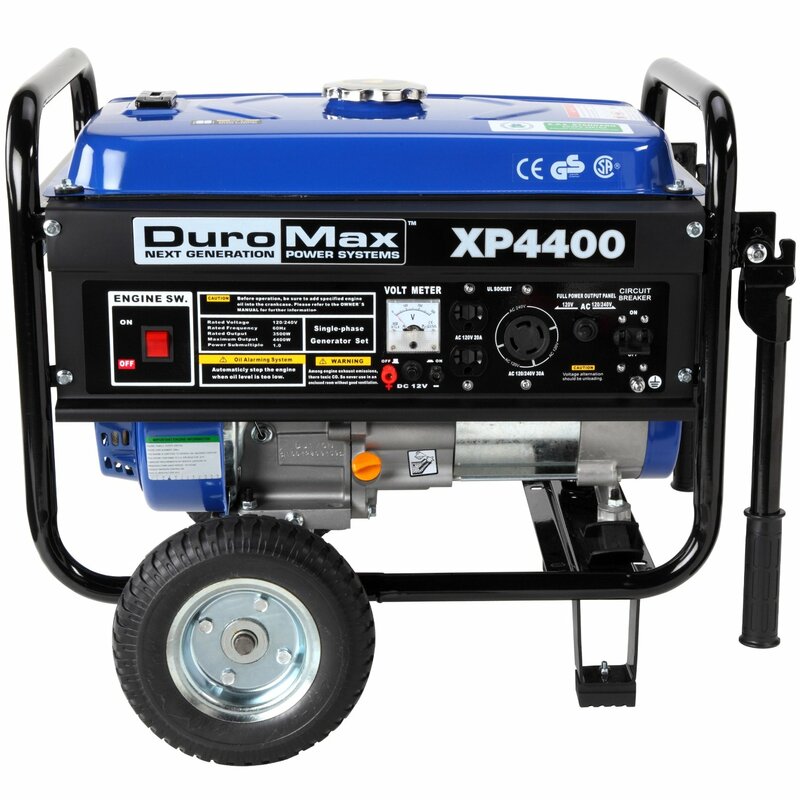 The internal specifications, such as the 4-gallon tank, running at 8-hour runtime, and an electric start are very similar to the DuroMax DS4000S. Weighing at 116 pounds, the heavy-duty steel frame is pretty light as compared to other generators in its league. With two standard outputs to standard household appliances or light sources, each operating at 120-volt and 20-amps. There is also an exclusive DuroMax RV switch for voltage selection, helping you get maximum power from each of the receptacles and pushing the buck from 120 volts to 240 volts when needed. This 4000-Watt power horse by Generac is a 220cc OHVI engine marvel and one of the best generators out in the market. With 4500 surge wattage and 3600 Watts continuous supply, the Generac 5778 is complete with a full-wrap frame tubing that secures the internal frame and gives it a compact look. The control panel is illuminated for clear visibility and the 4.5-gallon tank ensures that the generator runs for a good 13-hour stretch at 50% load. Using the Generac 5778, you can run a number of appliances, including your air-conditioner, refrigerator, and your other electrical appliances. It has 4 5-20R GFCI and 1 L14-20R outlets along with a 120/240 volts twistlock for power-up. Weighing a good 140 pounds, this mid-sized generator stays true to its functionalities. A Yamaha product is known for its reliability and power, and this Yamaha product is no different. This generator puts up a quaint picture of an efficient system running at 4000 Watts and powering up using a 375cc OHV air-cooled 4-stroke engine, allowing a surge of 4500 Watts. Power requirements can be well adjusted to run @1000-2600 rpm, enough to power up a motorboat and get it going. The design is sleek and trendy and it also makes for a good storage option due to its size (30.7 x 24.3 x 27.2). Using gasoline, the 4.5-gallon tank can power up your appliances and home for a running time of 15.2 hours when used at 25% load. The Yamaha EF4500iSE emits a moderate sound level at around 65-68 dB when it runs at a commendable load. These 5 products are the best-in-class offerings within the power generator realm, which offers relief to anyone hunting for a great generator to satisfy their everyday needs. You don’t need to be an expert to get these machines started, and now, with the all-encompassing list, all you have to do is check your own requirements and go shopping. All products are available on Amazon.com.